Katmai Grizzly bear, Radio Show Broadcast on Lensflare Live. Male grizzly bear, brown bear photo, (Ursus arctos) Katmai National Park, Alaska. Please click on the thumbnail to view a larger version of the photo. Just a quick note here to say if you can, check out this online radio interview (GONE) Tuesday, May 4, 2010, at 9pm EST. I’ll be talking with photographers Greg Downing and E.J. Peiker, of Naturescapes.net, and host Dave Warner, from Lensflarelive. It should be a lot of fun to do, and hopefully interesting and useful as well. I know I’m excited about it, Greg and EJ are great photographers whom I’ve admired for a long time, and it’ll be nice to talk with them. Well be talking about wilderness photography, backpacking and hiking and photographing, as well as some environmental/conservation topics that might be relevant to nature photography. Greg also had the idea of present a few images online and we can discuss those and present a little more context about the work. I’m not really sure all of what we’ll talk about yet, but the show is open to call in, and it’d be great to hear from you on air. Hopefully the conversation will be interesting. The broadcast can be heard live here. If you miss the show, it will be edited and available as a podcast soon after – I’ll add a link to this post when that becomes available. 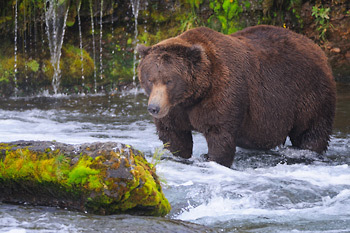 This entry was posted in Alaska, Art, Cool stories, Environmental Issues, Grizzly Bears, Katmai National Park, News, Photography, Social Media, Wildlife and tagged Brown bears, Grizzly Bears, Katmai National Park, Lensflare, Photography, Ursus arctos, wilderness on May 3, 2010 by Carl D.
For those who listened in, thanks so much. The broadcast was a lot of fun, and will be released on podcast via iTunes within a week or so. I’ll update this post with a link to it as soon as it’s available. Hey Carl. I listened to it yesterday afternoon and it was great! It was quite lengthy.